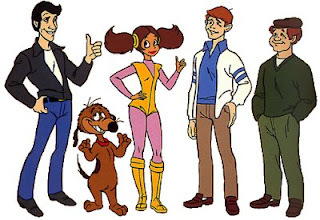 There's been a lot of bad animated adaptations of TV shows over the years, most of them from the 70's and early 80's. First, there's "Fonz and the Happy Days Gang" where we still have The Fonz, Ralph and Richie... but who's that girl in pink? Well, her name's Cupcake and she's from the future. Of course, you've also got the obligatory animal sidekick, Mr. Cool. 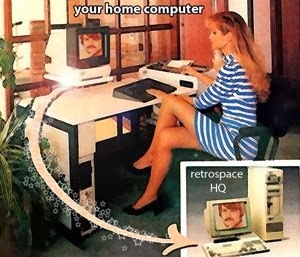 In 1974 we were supposed to be treated to an updated version of "The Jetsons" with a teenage Elroy. 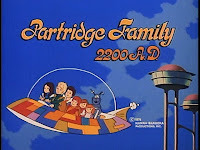 Instead they went with "Partridge Family 2200 AD" which featured the obligatory animal sidekick, a robot dog named Orbit. 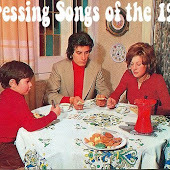 Then there's "The Brady Kids" which chunked Mike, Carol and Alice in favor of two obligatory animal sidekicks, Ping and Pong (they were pandas in case you were wondering). 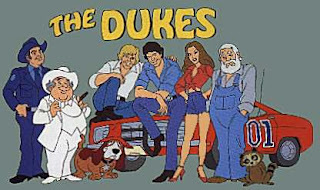 And let's not forget "The Dukes". Do you remember when Tom Wopat and John Schneider were replaced suddenly by Coy and Vance? It seems the Duke boys were seeing dollar signs. Well, the cartoon happened to start during these ugly salary negotiations and subsequently featured Coy and Vance instead of Bo and Luke. By the time Wopat at Schneider realized they had blown a good thing and returned to the show, it was too damn late. The show was cancelled and the animated version was replaced by Plastic Man reruns... how humiliating. Also, "Laverne & Shirley" had a cartoon called "Laverne & Shirley in the Army" as well as another animated show featuring The Fonz. Not surprisingly, "Mork & Mindy" was made into a cartoon as well. Both had the obligatory animal sidekick: Mork had an pink alien that looked like a poodle, and Laverne and Shirley had a little pig in a military uniform. Explain this to me: the Professor can't fix a hole on the S.S. Minnow, yet somehow he's able to build the castaways a space ship? In the animated series "Gilligan's Planet" Dawn Wells had to do double duty as the voice of both Mary-Ann and Ginger (with white hair!) since Tina Louise wisely wouldn't participate. By the way, it features an obligatory animal sidekick named Bumper. "Yapple Dapple!" was the idiotic catchphrase of Babu, the bumbling fat genie friend on "Jeannie". Many may remember Babu from his participation in the Laugh-O-Lympics. As a youngster, this character annoyed me more than The Great Gazoo and Scrappy Doo combined, indeed my hatred of Babu was white hot. Interesting fact: the boy who finds the bottle is none other than Mark Hamill! 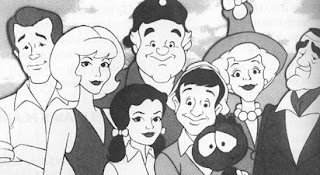 In 1972, ABC released a number of animated rip-offs from TV under the title "The ABC Saturday Superstar Movies". 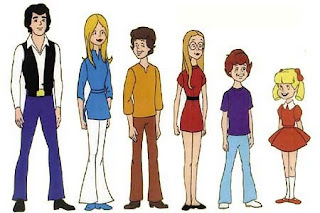 The program featured animated versions of "Gidget", "Lost in Space" and, my favorite, a "Bewitched" spin-off called "Tabatha and Adam and the Clown Family". For some reason, I find the strangest of all to be "That Girl in Wonderland" by Rankin-Bass (the same guys that brought you those Christmas specials like "Rudolph's Shiny New Year"). It just seems an odd TV show to adapt to a Saturday cartoon... sort of akin to making "The Odd Couple" or "Green Acres" into a cartoon. Anyway, here's a YouTube of it, if you don't mind a rather poor picture quality. Oh, and to you Trekkies out there - I know there was a "Star Trek" cartoon. I just wanted to make you wait till the end of the post. Mercifully, there were no obligatory animal sidekicks. I was lookid aqt your feedjit widget, showing where your lastest vists come from I guess, and I have seen my sithe there, I am the guy from Kunming, but now see a bunch of hits from Beijing and Shenzhen and Chonqing... I hope somehow my IP address in some way did not let a bunch of Chinese robots attack you. I grew with classic Saturday morning cartoons, always followed by an afternoon of b-movies (like Tarzan or John Wayne westerns), and Wide world of Sports and Mutual of Omaha's Wild Kingdom, with 200 year old Marlon Perkins wrestling anacondas. 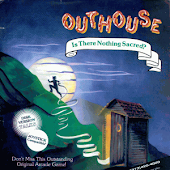 I co-wrote some episodes of the MORK & MINDY animated series. It was produced by Hanna-Barbera but the work was farmed out to Ruby-Spears. The show sucked. Robin Williams was contractually obliged to supply Mork's voice and from what was reported to us, he did all his lines flat on his back in his bedroom rather than come into a recording studio. willy- Once upon a time Saturday was about the only time you'd find cartoons. Now, my kids have ten networks running nothing but cartoons 24-7. The "specialness" of cartoons is gone. 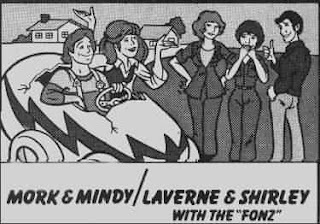 Back then, even a cartoon version of Laverne and Shirley was a treat. buzz- That's pretty impressive that you were involved in the Mork cartoon (even though, as you said, it sucked). Still, that's kind of a cool claim to fame. I guess Robin Williams felt the cartoon was beneath him. In my opinion, he should have done the best he job he could do, regardless of how much they paid him or the lack of honor/glory attached to voicing cartoon characters. Sounds like he needed a good kick in the shazbot. Not considering the circumstance. I won't mention the name of the story editor (though he's passed on his sons are still involved in show biz so there's no need to make 'em feel bad), but he was almost willfully ignorant of the prime time MORK & MINDY show and kept changing scripts to reflect what he believed the show was about, not the actual program itself. buzz - Interesting to hear the background on why the cartoon was so off the mark. Now if we could only figure out the background to why the live action show went bezerk in its second season (I'm still recovering from the birth of Jonathan Winters). Scrappy Doo seriously annoys me as well. It would be remiss to fail to note that the porcine military officer in the Laverne & Shirley cartoon was voiced by none other than Ron "Horschack" Palillo. And they did make a cartoon version of The Odd Couple. It was called The Oddball Couple and featured a slovenly dog named Fleabag and a neatnik cat named Spiffy. Weirder still was The Barkleys; basically, All In The Family with dogs. Another cartoon adaptation of a prime-time TV show was Help! It's the Hair Bear Bunch!, which was a thinly-disguised version of Hogan's Heroes. 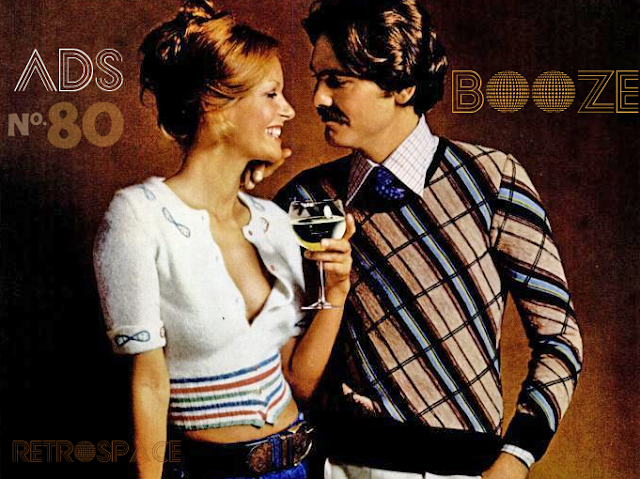 This may sound like I'm reaching, but careful analysis bears out my theory. The bears' leader, Hair Bear, was suave and sophisticated and could talk himself out of any situation; much like Colonel Hogan. Square Bear was slow-witted with a slight Southern accent; Sgt. Carter. Bubbi Bear was diminutive in size and often spoke in words none of the others could understand; Cpl. LeBeau. They were ostensibly confined in a government-run containment facility, but in reality came and went as they pleased. Their jailors were a thin reedy man with delusions of his own importance, and his overweight oafish second-in-command. Sounds like Hogan's Heroes to me. well then you could say Top Cat is Sgt Bilko and Flintstones is Honeymooners, Scooby-Doo is Dobie Gillis in b old dark house movies from the 30s and all of the HB animal stars are based off of some old 30s/40s comic. Why didn't Jeannie look like Barbara Eden in the cartoon? Cartoonists usually make the animated characters look like the actors who do the particular voices, and Julie McWhirter did the voice for the cartoon Jeannie.